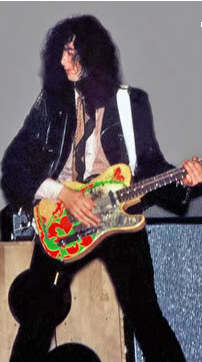 The "Dragon" was a blonde 1959 Telecaster given to Page by Jeff Beck, which Page painted with a psychedelic dragon design and played with the Yardbirds. It was used to record the first Led Zeppelin album and used on the early tours during 1968-1969. It was later used to record the "Stairway To Heaven" solo. Apparently, after "Stairway to Heaven", it was put away for a while, and then loaned to a roadie who refinished it in brown for some reason.